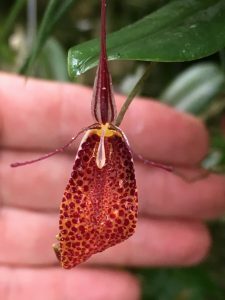 Restrepia guttulata like most restrepias is a cloud forests species enjoying cool, wet conditions. The species is found through the length of the Andes from Venezuela to Peru and altitudes from 1700m to 3000m. As you would expect from the extensive range the species is variable in colour and flower size but is one of the larger members of the genus. 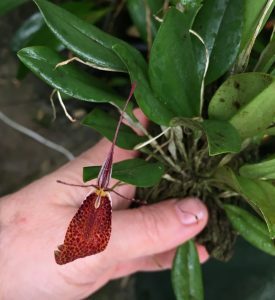 To be more specific it has flowers larger than the average restrepia but plants no larger than average and relatively compact making in a great species to grow. The plant featured here is growing in a basket but the species also succeeds in small pots or mounted on bark. We find that the secret to good culture is lots and lots of water. If a plant becomes really dry it resorts to growing keikis from the top of the stem and base of the leaves.